If you thought you could take a break from your garden and hibernate over winter, not so fast! Yes, you will need less frequent visits but if you are looking forward to a beautiful and healthy garden next season, there are still a few tasks you will need to accomplish. If you haven’t cleaned up your perennials, then winter is the time to perform that task. Your yard and flower beds will look much tidier and grow healthier and lovelier next season if you keep it clean. Perennials come back from underneath the ground each spring so there is no need to keep the unattractive dead steams around your garden. If you have seeding perennials you may leave them for the birds if you wish and spread the wealth while feeding wintering birds. You may also consider leaving Ornamental grasses till the end of Winter if they are standing strong, they will still maintain beauty over winter and add a touch of interest to your landscape. Make sure to cut back any diseased plants and clean up any leaves and debris that have fallen from plants and trees. Dispose of the entire plant and debris outside your garden, do not use your compost. Bacteria and fungal spores that cause disease in plants can survive in warm safe compost piles. While mulch in flower beds and around trees can help deter weeds, and hold in moisture during hot months, it also performs an even more important job in the cold months of winter. Yes, mulch is one of the most important things you can do for your garden. Mulch will protect the root systems by keeping a steady ground temperature, this will keep your plants in a state of dormancy thus preventing the triggering of new growth before the livable season has come. Not only will you protect your plants for the next growing season, but you will also give your garden a fresh new dose of color and beauty for the next few months. Late winter is the best time for pruning in this region. Pruning deciduous plants in the winter promote fast regrowth in the spring, as most plants are dormant during the winter you will cause less damage if you slip here and there. Waiting till winter will also make it less likely that you will mess anything up as it’s easier to see the shape of deciduous plants since their foliage is gone. • Prune on a mild, dry day. 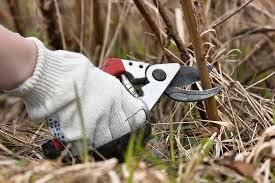 • When pruning, first prune out dead and diseased branches. • Remove the overgrown and smaller branches to increase light and air at the crowns. • Cut branches at the node, the point at which one branch or twig attaches to another. Later in winter just before spring, you’ll also want to prune your roses. In the Pacific Northwest, Mid-February is generally when you want to get this done, you might see the buds begin swelling sooner than that but wait till Mid-February when it’s less likely to frost again. The general rule is to prune an established rose to half its size. 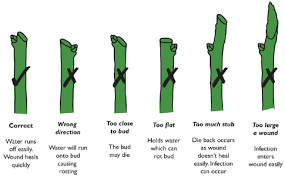 Choose your cuts above an outward facing bud. If you need any assistance with your garden this winter please feel free to contact Kaleidoscope Landscape Inc, our team consists of CPH gardeners, and Master Pruners. We've been doing this for 35 years because we love it!